The shape of your face helps determine which hairstyles will look best on you. Knowing your face shape isn't necessarily automatic; we're all rounded, with eyes, nose and mouth set in the middle somewhere. Some people have a clearly defined face shape, but if yours isn't, it's easy to find out what it is. Once you've done that you can look for flattering hairstyles to suit your face. The easiest way to find your face shape is to look in the mirror with your hair pulled back and trace around the outline of your face with lipstick. The shape you see is your face shape. In shapes with angles, of course, the corners will be rounded. Another method uses measurements. Measure your face from one side to the other, across your cheekbones. Write down the measurement. Measure across your jawline where it's the widest, across your forehead at its widest point, and from your hairline at the center of your forehead to the bottom point of your chin. Write all of these measurements down. 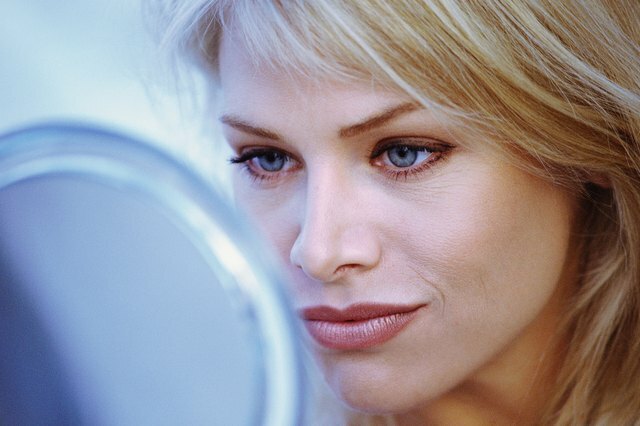 Note whether your face is angular at the jawline like a square or rectangle or softer like a square or circle. If your face is the same, or nearly the same, width as it is in length, with a rounded, curved jawline, you have a round face. Look for a hairstyle with volume at the crown, to elongate your face. A center part will make your face look less full. Stay away from a chin-length bob or hairstyles that are flat and without layers; these will emphasize the roundness of your face. Actress Christina Ricci has a round face. Oval faces are about one and a half times as long as they are wide. The jawline is soft and rounded. People with oval faces are fortunate, because they can wear almost any hairstyle. Avoid styles that have a lot of weight around the face, like long, heavy bangs; these can make your face look heavier. The oblong face is more than 60 percent longer than it is wide. If the jawline is angular, it may be referred to as a rectangular face. A cut with layers will soften the angles of your face, and wispy bangs will help balance it. If you let your hair grow too long, or add volume on top, this will make your face look even longer. Actress Sarah Jessica Parker has a rectangular face; Gwyneth Paltrow's face is oblong. A square face is nearly as wide as it is long, but unlike a round face, the jaw and hairline are angular. Try a medium-length hairstyle with wispy bangs and layers to soften your face. Side parts and soft curls are flattering. Heavy, straight-across bangs or chin-length, straight bobs emphasize the angles of a square face and aren't the most flattering choices. Actress Sandra Bullock has a square face shape. A heart-shaped face is wider at the forehead and tapers down to a narrow chin. Longer styles with volume near the ends, rather than at the top, help balance this face shape. Consider a side part with side-swept bangs to make the forehead less prominent and draw attention to your cheekbones. A style with lots of volume at the top, or that's very short and close to the neck, will be less flattering. Actress Jennifer Love Hewitt has a heart-shaped face.